Editor’s note: Passport to Cheese is Cheese Market News’ newest feature series exploring the dairy industries of nations around the world. Each month this series takes an in-depth look at various nations/regions’ dairy industries with coverage of their milk and cheese production statistics and key issues affecting them. The nations’ interplay with the United States, including both imports and exports, also will be explored. This month we are pleased to introduce our first nation — Mexico. MADISON, Wis. — Cheese is a popular ingredient in Mexican cuisine, and demand for cheese in Mexico is strong. 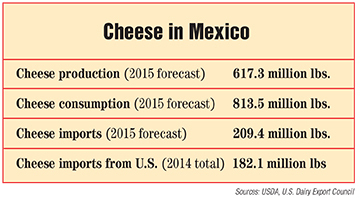 In 2015, total cheese consumption in Mexico is forecast to reach 369,000 metric tons (813.5 million pounds), according to USDA’s Foreign Agricultural Service (FAS) in its annual Mexico dairy products report. Mexico’s cheese production in January-December 2015 is forecast to total 280,000 metric tons (617.3 million pounds). Demand for aged cheeses is expected to remain strong among high and high-middle income consumers in Mexico, while low and lower-middle income consumers will maintain demand for fresh cheese products, FAS notes. According to Euromonitor, the market for retail cheese sales in Mexico is expected to be US$4.81 billion in 2015. Unpackaged cheese is very common in Mexico, Euromonitor says in a November 2014 trends report. This type of cheese is found in both modern and traditional retailers, including independent small grocers, markets and tianguis, or neighborhood street markets. Among the most common varieties of unpackaged cheese in Mexico are Fresco, Panela, Oaxaca and Manchego. Packaged cheese is mainly sold at modern grocers, Euromonitor says. An increasing number of consumers are selecting this type of cheese for convenience and time saving reasons. Packaged hard cheese grew 5 percent in volume during 2014, while unpackaged hard cheese increased by just 1 percent, Euromonitor says. Spreadable processed cheese was the fastest-growing cheese category in Mexico in 2014, with 7 percent growth by volume and 12 percent growth by value, Euromonitor says. This growth mainly was driven by the cream cheese brand Philadelphia (Mondelèz Mexico). In Mexico, cream cheese is used in desserts, to spread on toast and to cook several dishes such as meat or pasta. Cooking applications have increased the popularity of cream cheese since 2012, when Philadelphia launched a marketing campaign in Mexico focused on teaching how to include cream cheese in a variety of daily meals and not only for special occasions. Unspreadable processed cheese is used for hamburgers and sandwiches, making slices more common than sticks in Mexico, Euromonitor reports. Mondelèz Mexico also leads this category, as its Kraft Singles slices hold a 39-percent share. Soft cheese remains more popular than hard cheese in Mexico, Euromonitor says. The most popular fresh varieties are Oaxaca, Panela and Fresco. Fresh cheese is very popular in traditional cuisine, used in dishes like flautas de posso (fried chicken tacos), esquites (corn grains with cheese, lemon, chilli and mayonnaise), as well as desserts. FAS forecasts that cheese imports to Mexico will total 95,000 metric tons (209.4 million pounds) in January-December 2015, remaining flat compared to last year, as fluid milk availability will allow for increased domestic production. Mexico is expected to export 6,000 metric tons (13.2 million pounds) of cheese in 2015, up from last year as Mexican cheese manufacturers look to expand into foreign markets, supported by increased fluid milk production, FAS says. Mexico exports very little cheese to the United States, according to Alan Levitt, vice president of communications, U.S. Dairy Export Council (USDEC). In 2015, milk production in Mexico is forecast to reach 25.82 billion pounds, FAS reports. Meanwhile, 2015 fluid milk consumption (domestic and factory use) in 2015 is forecast to be 25.88 billion pounds. With high demand for cheese and other dairy products but limited milk production, Mexico depends on imports for about 30-35 percent of its dairy product needs, Levitt says. Mexico’s dairy deficit, plus its proximity to the United States and broad market access (all U.S. dairy products enter Mexico duty-free), make it an ideal market for U.S. dairy exports. Mexico is by far the largest export market by volume for U.S. cheese. In 2014, the United States exported 82,579 metric tons (182.1 million pounds) of cheese to Mexico, up 14 percent from 2013, according to USDEC data. Not only is Mexico the largest market for U.S. dairy, but the United States is the dominant supplier of dairy products to the Mexican market, capturing 75 percent market share and a volume of approximately 480,000 metric tons (1.06 billion pounds) annually, FAS reports. FAS notes that rapid growth of Mexico’s food industry has been the primary market demand driver contributing to U.S. dairy exports. The strong investment in the processed food and retail sectors has led to a constant growth in demand for dairy products, including dairy ingredients, fluid milk, cheese, yogurt and frozen dairy desserts, FAS says. The main varieties of cheese the United States exports to Mexico are Mozzarella, Gouda, cream cheese, Cheddar, Monterey Jack and Parmesan, Levitt says. Some of the major U.S. exporters of cheese to Mexico are Glanbia Foods, Leprino Foods, Schreiber Foods, Lactalis American Group, Joseph Gallo Farms, Hilmar Cheese, Saputo, Swiss Valley Farms and Pacific Cheese. Mexico’s demand for U.S. dairy products has been transforming over the last 20 years, Levitt says, and while it has long been the No. 1 customer for dairy exports, some recent activities have helped boost this relationship even further. In 2008, USDEC launched a program with U.S. cheese manufacturers to build U.S. Gouda capabilities to service Mexico’s market. About half of the cheese consumed in Mexico is Gouda, but at that time not much of this type of cheese was made in the United States. Through this collaboration, USDEC helped research and identify specifications and characteristics buyers preferred, then worked with U.S. suppliers to help them produce the type of Gouda that would meet market needs. Glanbia Foods is one of the companies that worked with USDEC to develop Gouda exports for Mexico. Dave Snyder, Glanbia vice president of global business development, says USDEC was a catalyst in helping to build strong cheese exports to Mexico. Prior to 2008, he says Glanbia had exported some cheese barrels and Cheddar to Mexico for processing and shredding, but it was a very small volume. Now Glanbia exports mostly Gouda — made at its Southwest Cheese plant in Clovis, New Mexico — to Mexico, as well as colored and white Cheddar, Monterey Jack, Pepper Jack and some barrel curd for processing. Snyder says Glanbia now is the largest U.S. cheese exporter to Mexico. In addition to helping U.S. companies develop Gouda for export to Mexico, USDEC also worked on marketing and education efforts in Mexico to help build the export market. “USDEC did seminars down there, we did retail promotions, sampling in supermarkets and menu promotions advertising U.S. cheese,” Levitt says. In Mexico, Gouda typically is used for cooking and meal preparation, and often is used interchangeably with Mexican-style Manchego and Chihuahua cheeses in quesadillas and other dishes, Snyder says. More mild than the round, traditional-style Gouda like that from the Netherlands, the Gouda Glanbia produces for export to Mexico is manufactured in 20-kilogram blocks that are ideally suited for cut and wrap operations. Snyder says the ability to customize Gouda production for customers’ needs has given Glanbia a competitive advantage over other global suppliers. Levitt says Mexico’s market is stable in terms of consumption, though it always is a challenge to make product prices competitive, particularly in the current market. “Mexico is developed but not overly wealthy, so we have to keep products affordable,” he says. Despite current market challenges, Levitt says dairy exports to Mexico are expected to grow. “There are government programs to help encourage milk consumption there,” he says. Snyder says Glanbia’s cheese exports to Mexico have increased in late 2014 through most of 2015, though like other U.S. exports they have slowed down due to high U.S. versus global prices.